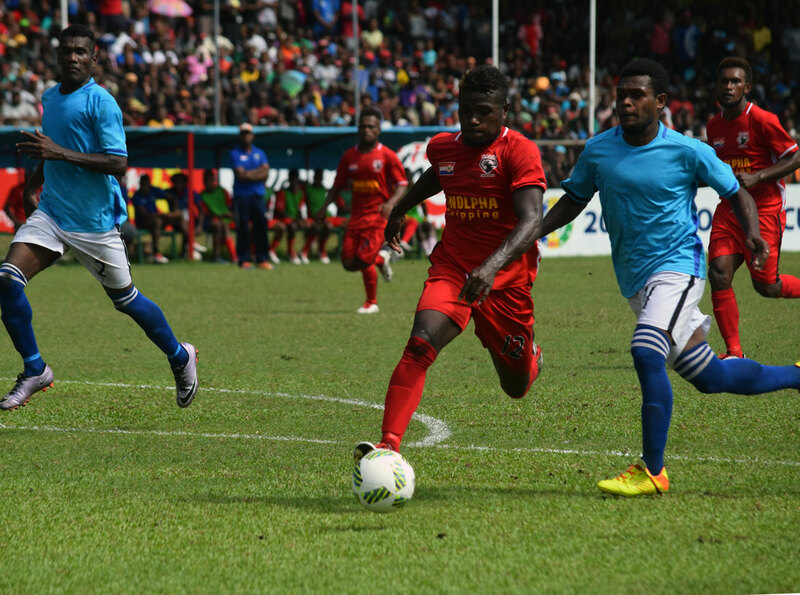 Malaita Eagles have written themselves into the history books as the most successful side in Solomon Cup history as they claimed their fourth title since 1991 with a 2-1 victory over Central Shield at Lawson Tama Stadium on Saturday. Malaita Eagles coach Terry Oiaka said his players form was impressive as they put the final to bed with a well deserved win. “I am really happy with my players performance as I knew that the final wouldn’t be easy,” Oiaka said. Malaita were firm favourites heading into the grand final and played like it as the match got underway, dominating the opening ten minutes. In-form striker Clement Baegani, also the tournament’s leading goalscorer, had several chances early on with one clear-cut chance with an open goal put just wide of the post. A quick counter-attack led to Malaita’s Fred Ani being brought down in the box, earning a penalty for the Eagles. Baegani stepped up and slotted past the keeper to give his side a 1-0 lead which they took into the break. Central Shields returned in the second half with great determination to bring themselves back into contention. The hustle paid off when Simon Steven was fouled and Central had a penalty of their own to convert. Captain Oscar Sara got behind the ball and converted from the spot for the equaliser. Although both sides had opportunities to put the match to bed, fortune favoured the defending champions on this occasion. Malaita captain Andrew Raragia was the hero of the day when he slotted his free kick in at the top corner to help his side claim the victory. Oiaka said successfully defending the title was a huge achievement for his young side. “It’s a big thing for us to defend the title as we know our province was once known for winning the tournament with home-based players during the days of Nelson Kabitana. Central Shields coach Tome Kiki was impressed with his side’s performance in their Solomon Cup grand-final debut. “My players understand that making the final alone is history and of course we aimed to create history again by winning the Solomon Cup title but we knew it would be tough,” he said.